Continental has taken the Conti.eContact that was originally launched in 2011 with electric vehicles in mind and refined it to meet the needs of hybrid models. Thanks to the introduction of numerous new technologies and processes, this new and extensively hand-crafted summer tire is the first from Continental to obtain the top A rating on the EU Tire Label for both wet grip and rolling resistance, while making no significant compromises in terms of the many other performance parameters. With immediate effect Continental is offering the Conti.eContact in six sizes for 17 and 18-inch rims, specially designed for models such as the Opel Ampera, BMW 5 ActiveHybrid, Lexus LS 600h and Porsche Cayenne S Hybrid, as well as other cars and SUVs with hybrid drive. Given that this is a new vehicle segment that also involves highly complex production processes, Continental is kicking off with low-volume production at its French tire plant in Sarreguemines. The rolling resistance of the new Conti.eContact for hybrid vehicles is some 20 percent lower than in a conventional tire, while delivering a wet braking performance similar to that of a normal car tire. This is made possible by a combination of advanced technologies in the development, compounding and production sectors. In terms of handling and braking on dry roads, the tire performs at the same high level as a Continental sedan tire of comparable size. As a member of the Continental tire family for hybrid and electric vehicles, the Conti.eContact bears the “BlueEco” logo on the sidewall. Continental’s in-house studies point to incremental growth in the proportion of hybrid vehicles in the passenger car segment, which could account for as much as eight percent by 2020. Featuring the newly developed Green Chili compound, the silica compound of the new Conti.eContact for hybrid vehicles is made up in such a way that the internal friction of the filler particles and the polymers is lower than in conventional rubber compounds. The use of special additives provides an additional boost in terms of handling properties. With this new compound, the chemists at Continental have achieved a marked reduction in rolling resistance, while maintaining a high level of handling and braking performance on dry roads. On wet roads the specially configured twin sipes in the tread blocks generate a ‘windshield wiper’ effect that breaks up the film of water under the contact patch. 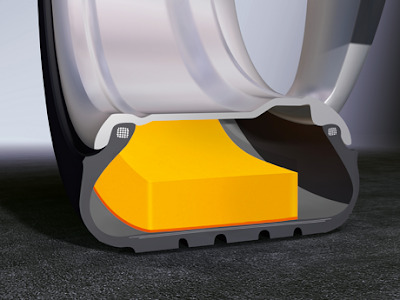 This smart thinking by the tread designers at Continental enables the water between the surface of the tread blocks and the road to be rapidly dispersed, making for very short stopping distances in the wet. The fast dispersion of the water also benefits the tire’s wet handling – even at higher speeds. The tread design makes a valuable contribution to the short stopping distances in the wet that led to the Conti.eContact’s A rating for wet grip on the EU Tire Label. AeroFlex technology Along with the new technologies adopted for the compound and tread design, the sidewalls of the new Conti.eContact have also been redesigned. In this case the tire designers focused on minimizing aerodynamic drag and rolling resistance. This they achieved through the aerodynamically modified sidewall and its flexible, lightweight design. As a result, in the new Conti.eContact less energy is lost when the tire deflects and rebounds than in a conventional tire. In addition, the drop in turbulence has led to a further reduction in the tire’s contribution to fuel consumption. When hybrid vehicles run in electric mode they are virtually silent. As tire noise is no longer drowned out by other sources of noise such as a conventional engine, it is all the more noticeable. Consequently, the new Conti.eContact is designed to generate minimum audible noise in the vehicle interior. This is achieved with the aid of ContiSilent technology. A thin layer of polyurethane foam attached to the inside of the tread reduces the vibrations that are generated as the tire rolls along the road. This means that less vibration is communicated to the chassis, leading to a lower level of noise in the cabin.